Customizable options for flower or concentrates. Funny accessories included along with practical. Could be packaged and organized better. Offerings seemed more geared toward beginners. No shirts or other accessories you normally find in subscription boxes. From one-time single box purchases to monthly subscriptions to even ordering just an individual pipe or vaporizer, Hippie Butler is your one-stop shop for everything you could possibly need to partake and enjoy marijuana. One time purchases or monthly subscriptions, Hippie Butler offers multiple options to customize your subscription box to your preferences and needs. The cheapest option is The Party Favor, only $1 a month (plus $1.99 for shipping), and it gives the subscriber a monthly shipment of Raw rolling papers and hemp wicks. Rollers Club for $15.99 a month includes free shipping and comes with a variety of rolling papers or wraps, pre-rolled cones, lighters, and a surprise accessory each month that could be anything from a container to a small pipe. You can also choose your preference for Rolling Papers or Hemp Wraps or a mix of both. The Butler Box is their standard and most popular offering, priced at $32.99 and includes free shipping. 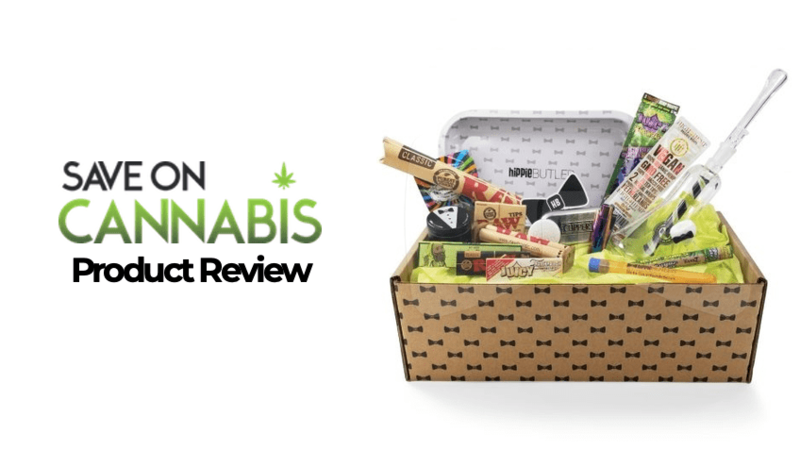 The box comes with a variety of wraps and papers and accessories listed above, but also includes a grinder and metal rolling tray and a glass pipe, and other fun accessories. Here, you can select a preference for Flower or Concentrates. Master’s Club is their most expensive offering priced at $139.99 month and is fully reviewed below. 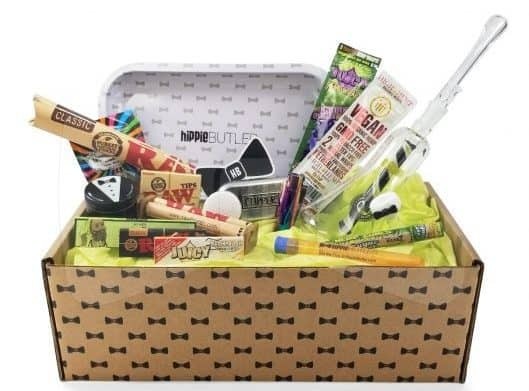 The box comes with everything mentioned above, including giant pre-rolled cones, and flavored wraps and papers, and depending on the preferences selected, a bong or device of some kind. With the Master’s Club you can select Flower, Concentrate, or a Mix of the two. For this article, we reviewed the Master’s Club Flower edition. Of special note, Hippie Butler also sells everything included in their subscription boxes individually on their website. They have a large assortment of rolling papers and wraps in a variety of flavors, as well as different bongs and pipes and grinders in various designs and colors. They also have much more expensive devices and accessories for sale that are not included in subscription boxes, like Volcanoes and larger bongs, and even clothing and cleaning accessories. We reviewed the Master’s Club Flower box for October, which came with quite a few different accessories and devices for enjoying fresh flower. The boxes switch up its contents each month, so you don’t end up getting the same thing every time. There’s a lot to go over, so bear with us. The centerpiece of October’s box is the Hippie Butler Bell by Conviction Glass. 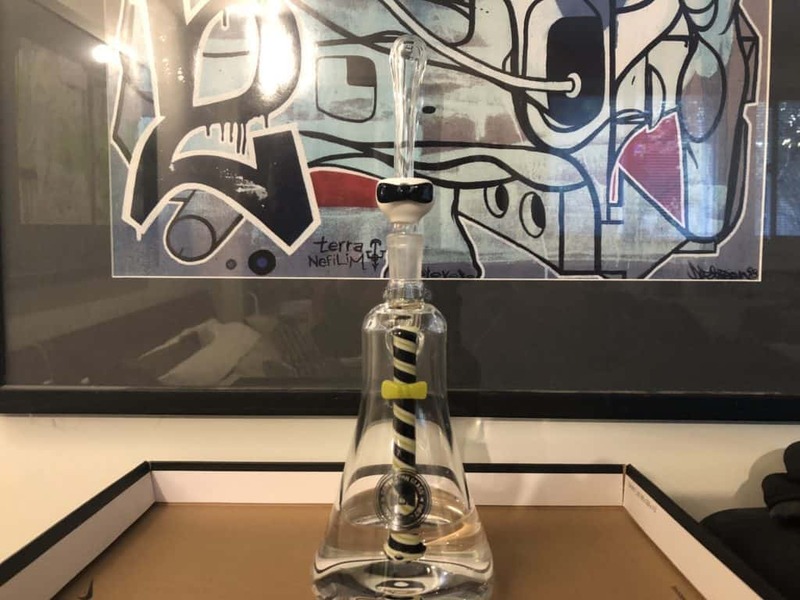 A medium sized bong with Hippie Butler branding, featuring a colorful downstem with a glass butler’s bowtie on it. It has a 14mm Female joint that will fit 14mm Male accessories and replacements. Individually retails for $145.00 on the Hippie Butler’s store page. To go along with the bong, the box included a 14mm male flower bowl. 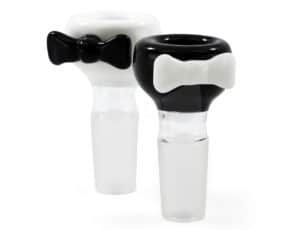 Mine was white and was branded with a black glass bowtie. Individually retails for $20.00 on the Hippie Butler’s store page. Also included, was a Hippie Butler Black 4-Piece Grinder branded on the top like a butler’s shirt, jacket, and bowtie. 50mm tall and 56mm in diameter, the lightweight grinder is great for traveling and features the usual mesh pollen screen and storage compartment. Individually retails for $16.99 on the Hippie Butler’s store page. The final company branded accessory is the Hippie Butler Bow Tie Rolling Tray. 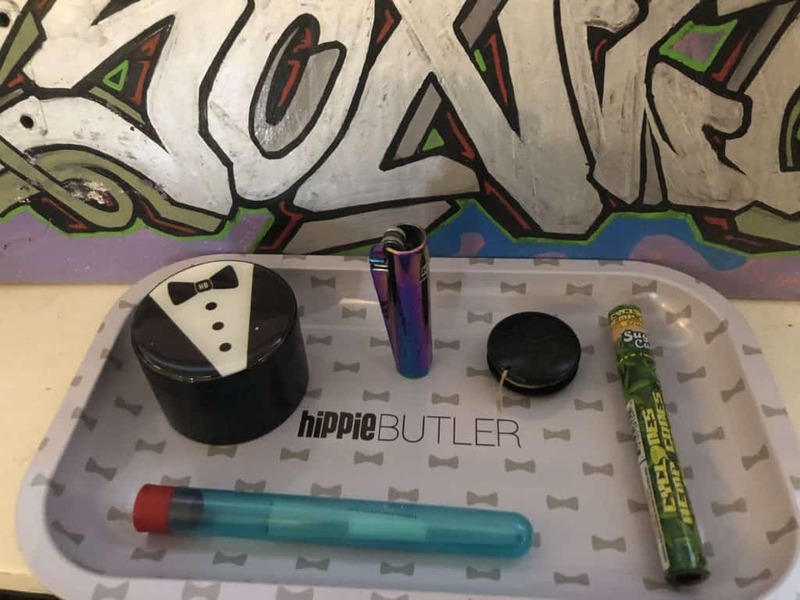 A simple 6.5″ x 10.75″ metal rolling tray, and advertised as, “the perfect size for taking on the go!” Individually retails for $12.00 on the Hippie Butler’s store page. A Metallic Rainbow Clipper Lighter was included, a polished full-metal lighter with a rainbow chrome finish. Easily to refill or replace the flint. Also provided is a Quik Wikk Mini Hemp Wick to keep the flame going without using any butane. A RAW 110mm Rolling Machine, the “training wheels of joint rolling.” This extra-large version is perfect for those long joints to have with friends. To go along with the rolling machine is a nice selection of rolling papers. I received Zig Zag Organic Hemp King Size Rolling Papers, RAW 1 1/4 Rolling Papers, and Juicy Jay’s Marshmallow 1 1/4 Rolling Papers. And to make things even easier, Hippie Butler also included a pack of RAW pre-rolled tips. An easy simple filter that fits perfectly into the RAW 110 Rolling Machine. If the rolling machine isn’t enough, the Master’s Club box also comes with multiple pre-rolled cones. One is a short pre-rolled cone that comes in a Hippie Butler branded doob tube that is more about the future storage case than a pre-rolled cone. Second is Cyclones Hemp Sugar Cane Cone, a nice sweet pre-roll cone that has a really cool sugar cane wooden tip. 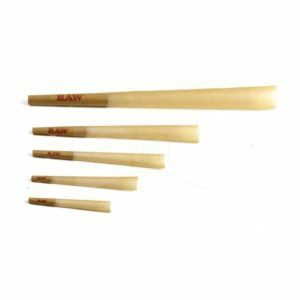 Quite possibly the most entertaining item in the subscription box, the RAW 5-Stage Rawket includes 5 differently sized pre-roll cones, the largest of which nicknamed the Supernatural and maxes out at 12 inches. Lastly, the box included 2 different flavors of wraps, a 3-pack of High Hemp Honey Pot Swirl and a single Juicy Hemp Wraps Grapes Gone Wild, and also a multipack of Cotton Mouth Candy that is specifically manufactured to relieve dry mouth. Everything came in a slim shoebox-sized box with Hippie Butler bowtie branding all over it. The presentation took a backseat to packaging and bubble wrap, but everything came shipped neatly together in the box. With that said, the Hippie Butler Bell’s downstem was broken upon arrival. 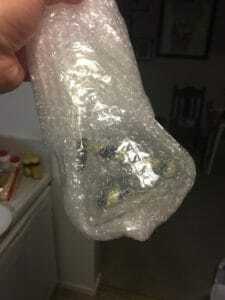 Even though it was wrapped in a substantial amount of bubble wrap, the glass bong was left with too much space to move around in the box, and I could easily see how an inconsiderate or clumsy delivery person could have broken in transport. I would hope future deliveries will improve the packaging and delivery to prevent future breakages. I contacted Hippie Butler through the Sales email listed on their homepage and explained the broken downstem. At this point, I had not removed the bubble wrap, but could see the broken stem and I actually just assumed it was a bong that just needed a replacement stem. The following morning their Support team got back to me requesting pictures of the broken downstem, I replied back with the requested pictures, and about 3 days later at most I had the replacement Hippie Butler Bell delivered in sturdier packaging material. Upon opening the new Hippie Butler Bell, I realized the stem was built in and customized and could never be replaced, and I really appreciated the quick replacement. Overall, while the packaging could be improved, their customer service was very much appreciated and quick to help. The Hippie Butler Bell is a really nice and clean looking bong. I almost want to call it a bubbler, but I think it’s just big enough to classify as a medium sized bong. The inside downstem has a very cool and colorful design that looks great through the clear glass base of the bong. The provided flower bowl fits smoothly and matches perfectly with the overall design and aesthetic. We used the Hippie Butler Bell with fresh flower in the bowl, but also made use of a quartz nail we had lying around and enjoyed some concentrates with it. It smoked clean and smooth, and overall, just looked cool as the smoke swirled around the brightly colored downstem. If I had any complaints, it’s that the bell is not big enough to use ice with it, but it definitely doesn’t ruin anything. I’m someone who prefers to roll their own joints and blunts, so I really enjoyed the variety of rolling accessories they provided. They give you a nice selection of brands to try, and the pre-rolled cones make things especially convenient. I’ve settled on RAW as my brand of choice, and I already had plenty of their papers lying around, so I decided to focus on the other brands. I first rolled up some Cookies OG into a Juicy Jay Marshmallow joint, and the marshmallow flavoring was pretty subtle, and definitely added to the enjoyment, and did not overpower the natural taste of the herb. The following day I made use of the RAW Rolling Machine to roll 1 king size Zig Zag Hemp joint using Skywalker OG, mainly because it was the perfect size for the machine, and I quickly remembered why I’m not a fan of the rolling machines. While the machines roll a perfectly cylindrical joint, they’re relatively skinny and get packed a bit too tight for my tastes. It’s perfect to help beginners get started on learning how to roll, but I prefer to roll my own cone-shaped joints than machine-made cylinders. From the selections of wraps and pre-rolled cones, we decided to try the Cyclones Hemp Sugar Cane Cone with some Cookies OG. This was a really fantastic pre-roll cone that smoked really clean and tasted sweet. We plan to save the sugar cane wooden tip and see if we can repurpose it for another joint. I plan to get more of these for the future from the website’s store page. Lastly, RAW Rawket was left untouched. I really wanted to try rolling a 12-inch cone to share here in the review, but there’s really no justification for making one unless you have a large group of people to share it with. Definitely more of a gag gift than a useful gift, but it will be fun to break out at the next BBQ when I have more people to share it with. All in all, a nice selection or rolling products. Nothing you couldn’t find on your own by going to your nearby dispensary or head shop, but nice to have it all shipped conveniently to your home. The grinder was a nice surprise and has a really clean design and finish to it. It’s your classic 4 piece grinder that every cannabis enthusiast should own. The keef tray on the bottom is a must have for anyone, and it’s nice to see that Hippie Butler didn’t skimp on their offerings by including a cheap plastic grinder. The butler tuxedo branding also looks great. The metal rolling tray, while such a simple accessory, was actually one of my favorite things to come with the Master’s Club box. I have been smoking for years and years, but I have never gotten around to getting a proper rolling tray. I’ve always settled on using old food delivery menus or just basic pieces of paper. The Hippie Butler rolling tray is the perfect size to roll joints or blunts, and easily wipes clean, or more appropriately, it’s easy to brush the shake off of it and back into your container of choice. I plan to make use of this tray for years to come, especially as I won’t be running out of papers anytime soon with everything they shipped me. The Cotton Mouth Candy was an interesting addition. My first thought was that it was THC infused candies, and I kind of got my hopes up, but a candy made to combat cotton mouth is still a fun idea. I tasted one after smoking, and I didn’t notice anything too different compared to normal sugar candy, but still a fun idea. We made use of the Metallic Rainbow Clipper Lighter and mini hemp wicks throughout our sessions reviewing the Master’s Club. The lighter is actually pretty cool looking and has a nice weight to it compared to your average plastic lighter. I tried to use hemp wicks, which my friends prefer, but I just couldn’t get into them. I find it funny to use a lighter to then light the wick to then light your bowl or joint, and while it is supposedly healthier in the long run, I just can’t see the point of it all being worth it in the long run. It was still nice to try though. I won’t lie, I would’ve loved if they could’ve sent actual fresh flower in the box, but the sheer variety of accessories and treats and tools and devices more than makes up for it. If I were to order another box in the future, I would just go for the Roller’s Club box at $15.99, and that wouldn’t be to supplement my supply of papers and wraps. It will always be more convenient to just run to the local head shop or corner store to get a pack of RAW papers as needed, but Hippie Butler will save some money and offer nice variety if in no rush and can wait for shipping. The majority of the items were all things I’ve seen for sale before at head shops or dispensaries. I’ve also been smoking for a number of years, so I already had versions of the Master’s Club contents lying around the apartment in some form or another. The rolling tray was the only item I actually “needed,” but like most smokers, I’m not going to say no to a new smoking device of some kind. The Master’s Club Box is perfect for new smokers, but I wouldn’t necessarily recommend it to anyone who has been doing this for a while, as they already have the majority of the selections offered. This was the biggest negative of the whole experience. Everything was just sort of tossed in a box together. The Hippie Butler Bell was wrapped in 2 or 3 layers of bubble wrap, but its downstem still broke during the shipping. 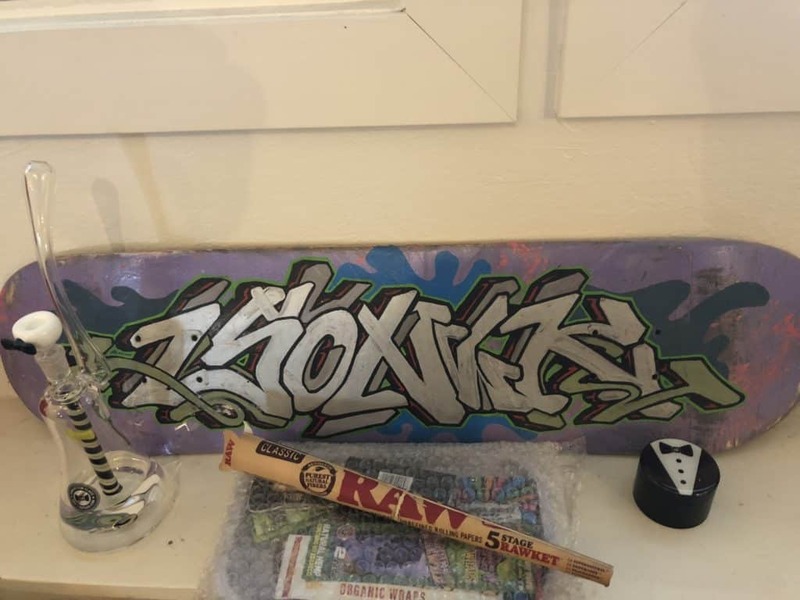 The rolling tray was also wrapped in bubble wrap with a few wraps and paper tucked into it, but the rest was just mixed in with the contents in their own standard packaging. I would like to see future boxes come in more secure and structured packaging, maybe compartments to keep things from moving around so much during the shipping. Besides it protecting the products inside, it will also look much nicer upon opening. Shipping was very fast, and while the presentation and shipping damage was a negative at first, I was really pleased with the customer service and how quickly they replaced the broken Hippie Butler Bell. Everything included is a top of the line product and most are from well-established brands that have been around for years now (RAW and Zig Zag, etc). The bong and grinder and bowl are all things I would buy separately if I came across them in a store. The papers and wraps will last a long time with the amount they give you, and while I recommend using the wraps sooner rather than later, the papers and the rest are top quality products everyone should have on hand. The Master’s Club box is perfect for beginners, especially due to the joint roller and pre-rolled tips and cones. 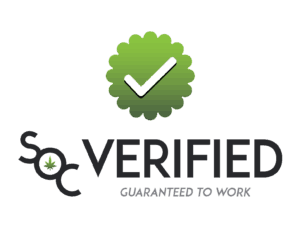 Everything you need to roll the perfect cylindrical joint is provided, and they made as easy as possible for anyone. If anything, I came close to knocking off points here for being too easy. As a long time smoker who has no trouble rolling their own, I wouldn’t have minded an option to get more wraps or flavored papers in place of the roller and tips. Comparing everything one by one to the prices on their website show just how much value is saved here. I didn’t do the exact math, but the Master’s Club box easily saves you $100. The cheaper options and smaller boxes are also a great deal, and you definitely get your bang for your buck. I don’t have any experience with other cannabis subscription boxes, but I have gotten a few different geeky ones like LootCrate. The quality of products and the amount and variety are great, especially if compared to a typical geek box with shirts and collectibles. With that said, I really wish Hippie Butler copied LootCrate slightly and offered subscribers a fun t-shirt or even a bong carrying case. It’s nice to get practical and useful accessories for smoking, but it would have been pretty cool to get a shirt or something similar that would last longer. Most of the offerings in the Master’s Club can be found at a local head shop, but it can be harder finding a cool cannabis shirt to wear. 10% OFF premium 420 subscription boxes at Hippie Butler! US & Canada Shipping. 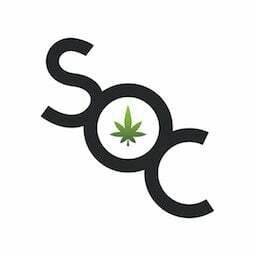 Save money with Cannabis Subscription Box coupon codes here.